Advances in low cost launch and rideshare approaches have helped, but finding real estate on satellite buses — large and small — continues to provide challenges to schedule and cost. 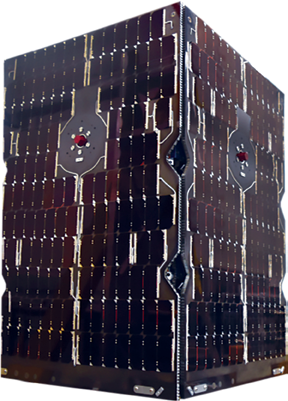 Operational payloads, such as the Aireon air traffic surveillance system on Iridium NEXT satellites, have demonstrated benefits of constellation-wide commercially hosted payloads. 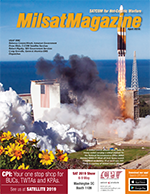 Experimenters and principal investigators, however, face daunting challenges to hosting their ‘one-time’ demonstration and experimental payloads on large satellites. They are often subject to overly involved and extraneous compatibility requirements with primary payloads, and a negligible ability to effect schedule and launch dates. Similarly, procuring a dedicated smaller satellite from industry providers to support payload requirements demands increased investment and oversight, and resultant longer timelines to get a payload to orbit. 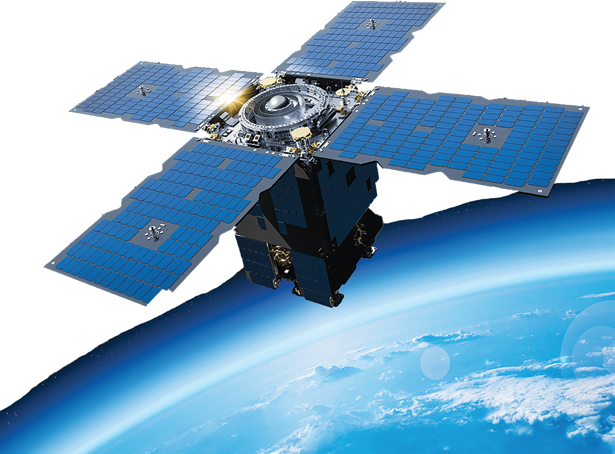 General Atomics Electromagnetic Systems (GA-EMS) is uniquely positioned to meet these challenges through a strategy of modular, scalable satellite designs and hosted payload platforms that can be optimized to suit the needs of multiple customers. With a rich heritage in satellite design and operational flight experience, GA-EMS offers a broad portfolio of bus sizes and capabilities, from Low Earth Orbit (LEO) CubeSats to 600 kilogram platforms that can be tailored to a payload provider’s unique mission needs. GA-EMS’ service approach allows the company to work closely with customers to negotiate the best solution, which can also include launch coordination and on-orbit mission control services, to deliver their payloads when and where they are needed. GA-EMS’ Orbital Test Bed (OTB) spacecraft are providing a much needed capability to rapidly and affordably deliver customer payloads into a broad range of Low Earth Orbits. The flexible, modular, and scalable architecture of the OTB platform is designed to be optimized for high performance missions and a broad range of payloads. 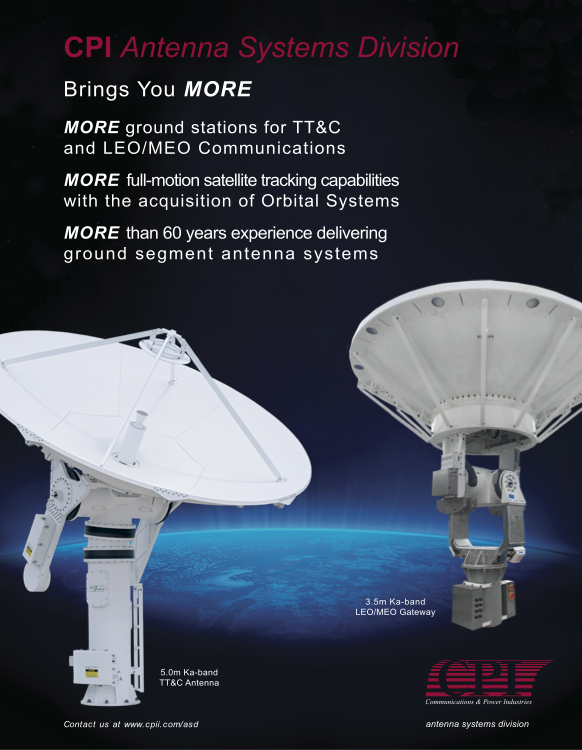 OTB’s versatility enables the launch of single or multiple payloads on a space platform, offering a more cost-effective solution to meet a wide variety of government, commercial, and academic technology demonstration requirements. The United States Government (USG) provides several avenues for rapidly and affordably flying space experiments and payloads. Most notable are NASA’s Rapid Spacecraft Development Organization (RSDO) program and the Department of Defense (DoD) Space Test Program (STP). The United States Air Force (USAF) Space & Missile Systems Center (SMC) Hosted Payload Solutions (HoPS) program provides a contracting capability to standardize processes and interfaces for placing military capabilities aboard commercial satellites. The OTB program is complementary to these programs and effectively uses them to further optimize the procurement process. The Mission Operations Center. Photo is courtesy of GA-EMS. For military payloads, STP has been providing flight opportunities for missions on the Space Experiments Review Board (SERB) priority list for more than 50 years. The Orbital Test Bed contracting approach is designed to streamline acquisition and reduce costs. The approach breaks from the current paradigm of selling a spacecraft to customers who — unlike for other commodities — can’t get the spacecraft back or resell it. For OTB missions, GA-EMS owns the spacecraft and recovers cost by providing flight services to the hosted payload providers. This enables a ‘lean forward’ procurement strategy that allows GA-EMS to start the planning for the next mission while working early to broker with and coordinate between interested payload providers. The first or ‘anchor’ payload provider is typically the most instrumental in defining the spacecraft and associated capabilities. However, GA-EMS retains the flexibility to enhance the bus design to accommodate additional hosted payloads without compromising the service provided to established payload providers. OTB, will demonstrate its functionality and utility for one-way-based navigation. This ESPA-class OTB also hosts additional payloads and experiments including an Air Force Research Laboratory (AFRL) Modular Solar Array, the USAF Academy Integrated Miniature Electrostatic Analyzer (iMESA-R). The primary payload suite consists of a radiation effects monitor (RadMon), a programmable receiver (FlexRx) and Celestis cremains. Planned for launch in 2022, another OTB spacecraft is being designed to host the NASA Langley, JPL-built, Multi-Angle Imager for Aerosols (MAIA) payload. MAIA will characterize the sizes, compositions and quantities of particulate matter in air pollution and the link with health issues. At 280 kilograms, this OTB spacecraft demonstrates the flexibility of the hosted payload service to tailor a solution to suit the large, unique MAIA payload. GA-EMS is also designing and building a third OTB spacecraft for a primary payload called the Remote Sensing Payload (ReSI). ReSI will provide reflectometry data of signals from Global Navigation Sensing System (GNSS) satellites. Through the HoPS contracting mechanism, the USAF’s SMC contracted for services to host and operate the Advanced Data Collection System (A-DCS) payload for NOAA/CNES. A-DCS supports the Argos worldwide location and data collection system by providing data used for studying oceans and atmospheric conditions; preserving and monitoring wildlife; managing water resources; and monitoring volcanoes, fishing fleets and shipments of dangerous goods. This OTB mission is planned for launch in early 2021 and is approximately two years after SMC contracted with GA-EMS for the hosting service, once again demonstrating the quick reaction capability of the OTB approach. The OTB lab. Photo is courtesy of GA-EMS. 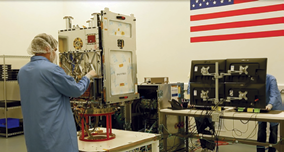 The Orbital Test Bed satellites are designed and built in the company’s Englewood, Colorado, facility. 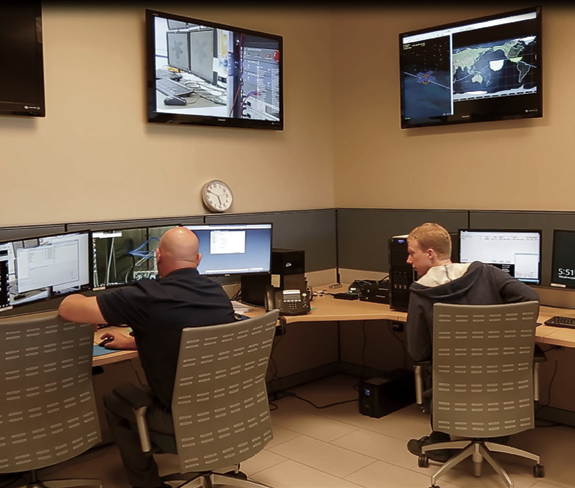 The Mission Operations Center (MOC) is also located in this facility to provide customers with control, operation and data download services for on-orbit payloads. GA-EMS is supporting launch and mission operations at their MOC for the first OTB and will also be the primary operations center for the OTB missions supporting the MAIA and ReSI missions. GA-EMS is the spacecraft manufacturer for Draper Laboratory’s NASA Commercial Lunar Payload Services (CLPS) program. The team will support NASA in the delivery of small rovers and instruments to meet lunar science and exploration needs, advance development of lunar landers for human missions, and conduct research on the moon’s surface ahead of a human return. GA-EMS will apply its manufacturing and satellite design expertise to deliver CLPS spacecraft supporting NASA’s next mission to the moon. GA-EMS is planning for future Orbital Test Bed missions and is working with primary, secondary and dedicated payload providers to define their service needs. Drawing from a broad portfolio of satellite platforms, early customer involvement in planning efforts will result in optimized platforms that meet payload and mission needs rapidly and more affordably. Craig Gravelle is the Director, Space Systems Strategic Development at General Atomics Electromagnetic Systems. Mr. Gravelle is responsible for the growth of the GA-EMS space systems business for US Department of Defense and civil government programs. Mr. Gravelle has more than 35 years of experience and has held senior management and executive positions in a variety of companies ranging from start-ups to large aerospace companies. He has a broad range of industry experience developing new business opportunities with the intelligence community, US Air Force, international clients, and commercial space systems customers.